Home Re-Engineer ME Incorporated. Strategy -n- Tactics Got Chess? Although I'm not very good at it, playing chess has empowered me to be more successful than I dreamed possible. Knowing just the basic moves, chess is an excellent way to exercise the mind for playing the game of life. Since it allows us to excercise both right and left brain, our creative senses are heightened for solving everyday problems. Many times I have encountered issues with coworkers or senior level people. Playing a game of chess, even if I lost, has helped me think of ways to resolve issues at the office. Or maybe a manger or client has presented me with a challenging project. At first glance the project seems overwhelming with many facets that require careful planning. As I write out the project plan and organize the resources, I take a time out to play chess. Bada bing bada boom, each issue encountered becomes easier to solve. Learning tactics and strategy in chess extends itself in helping us resolve personal and business challenges. Chess is not just for smart people, but anyone who plays chess definitely becomes smarter. 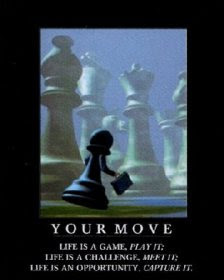 Click here to learn the basic moves of chess, while solving life's problems . . .